Provide comfort for the family of Donna Cook with a meaningful gesture of sympathy. Peacefully Tuesday, January 8th, 2019 at Health Sciences North, Sudbury. 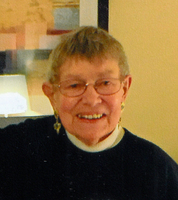 Beloved wife of Fred Cook. Cherished daughter of Alex and Irma MacPherson both predeceased. Loving sister of Rod MacPherson (wife Brenda) both predeceased, Glenn MacPherson (wife Florence), Scott MacPherson (wife Kate predeceased) and Randy Macklem. Special aunt to Shawn, Ryan, Troy, Amy, Emily, Jane Cook-Fernandes (husband Cyril) and great aunt to Christian and Laura. In lieu of flowers, donations to Church of the Ascension of a charity of your choice would be appreciated. To send flowers in memory of Donna Ann Elizabeth Cook (Macklem), please visit our Heartfelt Sympathies Store. Donations are being accepted for: Church of the Ascension Memorial Fund. Consider providing a gift of comfort for the family of Donna Cook by sending flowers. In memory of a beloved friend. My cousin, my best friend. Oh how I will miss you. Deborah.